Our beautiful candles are made from natural plant wax and are infused with essential or fragrance oils. They are hand poured in the UK and use the highest quality, ethically sourced ingredients. The glass is recycled and the wicks are cotton to help them burn cleanly and purely. We do not use any petrochemicals in our candles so they are kinder to your lungs. They are available in various fragrance and essential oil combinations to help you enjoy the little things in life. 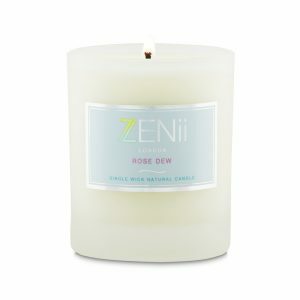 Reconnect, relax and de-stress with a beautiful ZENii candle..
All of our candles are made in the UK from natural sources and from the finest Ingredients. They are hand poured and made from ethically sourced ingredients. We use recycled glass and cotton wicks to help protect this wonderful planet. We do not use petrochemical paraffin which means our candles are kind to your lungs. They are made from essential oils and fragrance oils and can help you relax, de-stress and help lift your mood. Candles bring warmth and light and can help you enjoy the lovely moments in life. To get the best out of your candle always burn it for at least for 2 hours and a maximum of 4. This will ensure that the oils burn evenly and the scent beautifully fills your room. Never leave a candle unattended and make sure you keep candles out of reach from small children and pets. Always trim the wick to 1cm before lighting and do not use your candle once the wax level is below 1cm. Always keep ZENii candles in their original container. Keep them on an even surface. Do not use if the product is damaged. Keep out of reach of small children and pets. In the event of fire use WATER based sprays for fire extinction. In rare events can cause allergic reaction or skin reaction. Seek medical advice if you have any concerns and take the product with you when seeking medical advice.